The universal purpose of a ground layer in lacquer objects is to provide a smooth surface for the lacquer on top. Despite the fact that ground layers are not seen they have a great impact on the quality of the final product. Every flaw is transmitted to the top surface. The quality of materials will affect both the initial product and the longevity. Many objects that we have in museums have been valued since their production and were made with good materials. Perhaps this has distorted our perception that most Asian lacquer is of the highest quality. The truth is that the ordinary soup bowls are seldom found in western museums because they were not meant to last. Ground layers for Asian lacquer objects vary with local materials. Some contain lacquer as the binder and many do not. Binding materials found in ground layers across Asia can be made using any of the following materials: urushi, thitsi, laccol lacquer, various animal hide glues, persimmon juice, blood, starches and several different oils. Despite the fact that I am trying create lacquer surfaces that are quite diverse, I would like to standardize the ground layers. The watermarks I wish to study involve the surface layers so it is not necessary to recreate all the different types of ground materials used. I have decided to make the basic ground layer using Asian lacquer of the same type that the top layers will be. For example I will use an urushi binder for the boards that will be finished with urushi and laccol lacquer for the laccol boards. For these first sets of boards I used raw lacquer from China, which was packaged in Japan, and tonoko purchased in Tokyo. 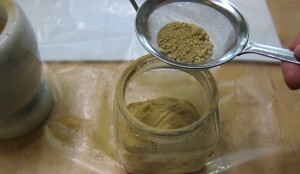 The beige coloured tonoko has been ground to a fine powder but over time it tends to form lumps. This meant I had to use a mortar and pestle to break down the lumps and then sieve out any larger particles before use. 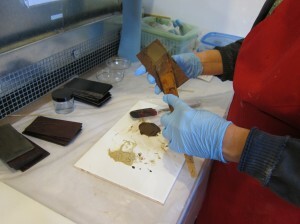 I have a large glossy ceramic tile for working with lacquer but a sheet of glass works as well. 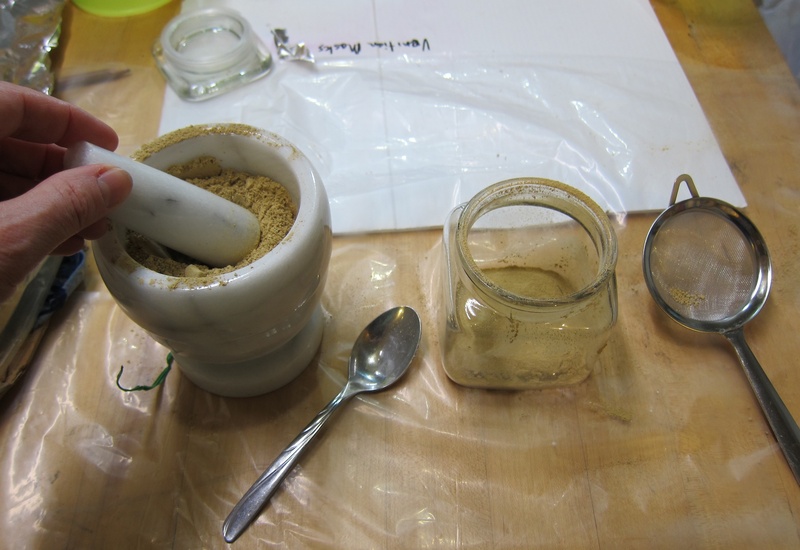 The tonoko and raw lacquer were put out in roughly equal amounts and mixed together with a Japanese wooden spatula. It is hard to say the exact amount as I add additional amounts of either ingredient until the mixture has the consistency of a butter cream icing. This is a messy job. One has to work at it until any fine lumps for tonoko are dissolved. To continue the cake decorating analogy, I applied it to the surface of the board with the spatula in the same manner. Did I say this was messy? The sabi seems to end up everywhere in addition to the panel. I hope I will improve over time. After application to one side of the 6 boards I put them in the furo to dry.